The Apple vs. Samsung court soap opera has taken a trip in a time machine to the year 1968. 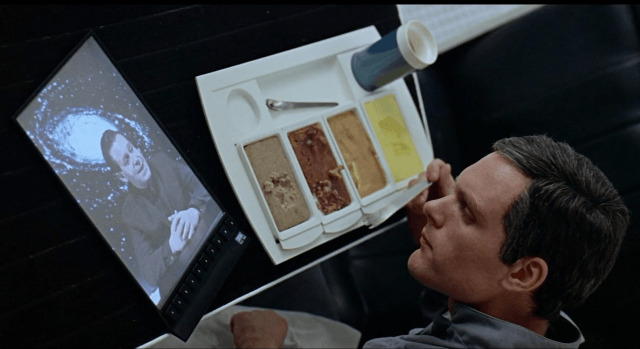 Samsung filed its opposition to Apple’s injunction in the United States, and in doing so cited Stanley Kubricks’s 2001: A Space Odyssey. Samsung is attempting to prove to the court that the design of a tablet computer did not originate at Apple. Samsung’s evidence states that the device pictured shares an overall rectangular shape, a dominant display, narrow borders, flat front surface, and a thin form factor. Which are all traits that both Apple’s iPad, and Samsung’s Tab 10.1 share. Kubrick’s film has always been considered one of the best Sci-Fi movies of all time, and this court case is showing just how ahead of its time the movie truly was. Apple’s case against Samsung has been a roller coaster, and it seems as though it is only getting warmed up. In Apple’s case in Germany it appears as though Apple submitted an edited picture of a Samsung tablet. Samsung’s tablet was altered to appear to be shaped more like the iPad. Apple has also been accused of doctoring a picture of Samsung’s Galaxy S phone so that it looks more like an iPhone. It’s hard to tell if the evidence provided by Samsung will be effective at all in this case, but it can’t be any worse than submitted altered pictures as evidence. As of right now the Samsung Tab 10.1 is currently for sale in the United States, and the Galaxy S II phones are rumored to be coming in October. Only time will tell if Apple will be able to block either device in the United States. It very entertaining to see a movie that is over 40 years old cited in a court case focused on two of the most advanced computing devices available.